Contact aspiration and stent retriever approaches for mechanical thrombectomy achieved similar efficacy and safety end points. 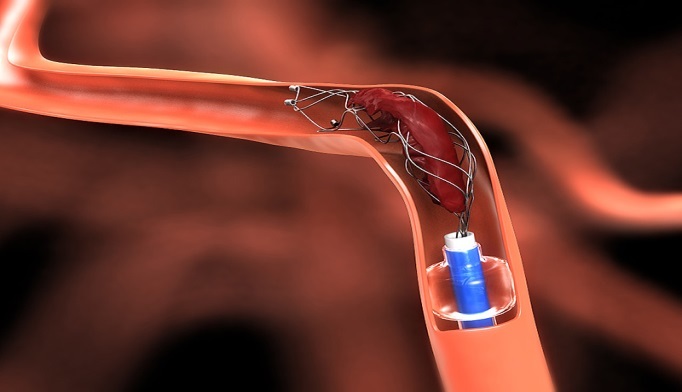 Both contact aspiration and stent retriever approaches in mechanical thrombectomy demonstrated similar efficacy and safety in patients with suspected acute ischemic stroke, according to clinical trial results presented at the 2017 International Stroke Conference in Houston, Texas. The ADAPT (Interest of Direct Aspiration First Pass Technique) for Thrombectomy Revascularization of Large Vessel Occlusion in Acute Ischemic Stroke (ASTER; Clinicaltrials.gov identifier: NCT02523261) trial was a prospective, randomized, multicenter, controlled, open-label clinical trial with blinded outcome conducted in 8 centers in France. The researchers compared mechanical thrombectomy with a stent retriever with contact aspiration in patients admitted with suspected ischemic anterior circulation stroke secondary to a larger vessel. All patients (n=381) were randomly assigned 1:1 to contact aspiration (n=189) or stent retriever (n=192). The primary outcome was successful revascularization (defined by modified thrombolysis in cerebral infarction score 2b-3). Secondary outcomes included successful revascularization after the assigned treatment technique, need for a rescue technique, procedural times, complications, and modified Rankin scale at 3 months. The mean age of patients was 71.7 years (contact aspiration) vs 68.1 years (stent retriever). Each group had about the same number of men (103 and 104, respectively), and prestroke modified Rankin scale score was 32 and 30, respectively. At the end of the endovascular procedure, successful revascularization (modified thrombolysis in cerebral infarction score 2b-3) was achieved in 85.4% of patients who received contact aspiration first compared with 83.1% of patients who received a stent retriever first (P =.53). The secondary outcome (successful revascularization after one of the treatments as the frontline strategy alone) occurred in 63.0% of patients who received contact aspiration vs 67.7% of patients who received a stent retriever (P =.33). In addition, the following complications occurred during the total procedure: embolization in a new territory (3.6% in aspiration vs 2.6% in stent retriever; P =.75), arterial perforation (2.6% in aspiration vs 1.6% in stent retriever; P =.69), arterial dissection (2.6% in aspiration vs 1.1% in stent retriever; P =.37), and vasospasm (2.6% in aspiration vs 6.3% in stent retriever; P =.08). Although there were no statistically significant differences between the 2 approaches, the researchers pointed out that the ASTER trial “opens the door” to adding contact aspiration (or the ADAPT approach) for clot removal. Subgroup and cost-efficacy analyses, as well as clinical outcomes, will be presented at the European Stroke Organisation Conference in May 2017. Disclosures: Dr Lapergue reports receiving an unrestricted research grant from Penumbra. Dr Piotin reports receiving research support from Stryker, Medtronic, Microvention, and Balt. Lapergue B, Labreuche J, Piotin M. Aster trial. Contact aspiration vs stent retriever front line for rencanalization in acute cerebral infarction. Presented at: 2017 International Stroke Conference; February 22-24, 2017; Houston, TX. Abstract LB2.